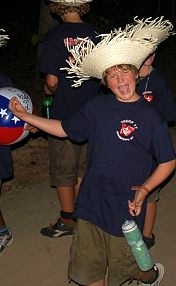 Summer Camp 2010 was a success and we all survived the record breaking heat at camp Cherokee. Pictures from the trip can be seen on our Troop17Jamestown.Shutterfly.com web site thanks to troop photographer Jim Black and a few others. What a GREAT week at Camp Cherokee. This was one of the best trips that I have been part of since we joined Troop 17. Although we did not will the “Spirit” award for the week, we did begin to find that we do have a great sense of troop spirit within us. From dancing and singing at the campfires, to inventing a troop cheer that was used at the daily roll call, they began to find that idea of pride for the troop they are part of. 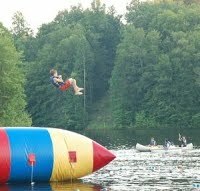 The boys had a great time participating in camp events such as “The Blob”, soccer, basketball, dodgeball and ever challenging orienteering course. We were able to maintain a 100% inspection grade for the week. One day we even received a 101! Both our the patrols qualified for Honor Patrol. I believe we were the only troop to have both qualify. We also were the recipient of the OA Spirit Award. Mark Travis earned enough points to receive the Scoutmaster Merit Badge. Robert Travis and Mike Mullins both sealed their membership in the Order of the Arrow by participating in the Brotherhood ceremony. We were able to work with many of the boys on advancement throughout the week. We had two boys advance to First Class and one to Second. Lets keep the momentum moving forward on this. There are quite a few Scouts who are only one or two requirements from moving up. Merit Badge completion was extremely high (considering the large number of required badges they took) and the partials were low. Most of the partials are just one requirement from completion. As your sons if they took Emergency Preparedness and/or Personal Fitness. They should be able to complete these easily. I cannot say enough about the way the boys behaved at camp. I believe they were surprised at the way some troops acted and did not follow their lead. They were polite and courteous with each other, the leaders that attended and the troops they encountered. I believe most of them were able to meet other boys who are Scouts in our district and council and that added to the experience. I noticed them saying “hello” when passing other Scouts. We had an outstanding group that attended camp and I hope to be able to experience this with them again.